Lately I’m getting more and more comments about what I’m putting on this page. For the most part, they’re positive, especially the ones I get face to face. I started this journey in early 2009; a time when I was lonely, angry, and crouching miserably behind walls of my own making. As far as I knew, the last person who cared whether I lived, got up in the morning, or died was getting ready to move out, though as it happens, her actual departure occurred a couple of years later. Still, the rift between us was growing. Yet in spite of our arguments and an inability to see eye to eye on many things, my daughter Heather encouraged me to do something she knew gave me pleasure, but was a gift I seldom gave myself. It was Heather who not only convinced me to start a blog but helped me set it up. Heather nagged and prodded until I agreed to spend a long Mother’s Day weekend in Sedona. And Heather helped launch a memoir which would take me on a journey of brutal honesty, but more importantly, a healing I wasn’t aware I needed. There have been stumbles along the way, like having her find out about my mom’s and dad’s suicides from my blog (I truly thought by then she knew), or months on end when posts were sporadic at best. But overall, I know without her help and encouragement, I’d never have started writing again; started breaking down the walls; learning how valuable and uplifting vulnerability can be. Each post I write these days is a testament to the progress I’ve made and the wounds I’ve healed thanks to a daughter who knew instinctively what I needed when I myself was oblivious (a state I’ve found myself in at many critical junctions). Without realizing it, she taught me the value in reaching out to others, not necessarily intending to help them. Instead, she taught me to let people know I was far from perfect and that my life had taken a few dramatic, traumatic twists and turns. In other words, there were times I was the one who needed help, even if I couldn’t or wouldn’t ask. I won’t say I wasn’t terrified at first. But it was also getting harder to hide the cracks in my masks, so ripping the band aid off didn’t seem so bad once I was a few years into digging up the old feelings and memories. The responses I got have been unexpected to say the least. When I first started talking openly about my parents’ suicides, I admit I was prepared to shut down again quickly if the responses were the expected horror and shock. Instead, I heard from friends and acquaintances who’d also lost someone to suicide. It seemed I’d opened a door we all needed opened, but hadn’t the courage, or perhaps the foolhardiness to open it ourselves. Knowing people were out there who understood what we’d been through and how hard it was to find anyone to listen while we talked felt like a huge boulder being removed from our shoulders. Making that tiny chink in my facade caused a ripple effect, changing the tone of my blog posts, opening my eyes to possibilities about my parents’ deaths, but best of all, allowing me to start releasing the guilt I’d been carrying for nearly 2 decades and beginning to heal. Until that point, I think I was simply rehashing the past. Discarding the first chapter of my memoir and doing a complete re-write is evidence that what I was feeling and believing when I first started writing has undergone a massive restructuring in recent years. I know I still have a long way to go but being open and honest, allowing people to see my wounds and scars has brought an entirely new family into my life. I now have people who grieve with me when I lose a cherished pet, check on me regularly, encourage me with my writing, and are simply there for me, no questions asked. I’ve never had that before. Not because these people weren’t there, but because I wasn’t letting anyone in. For years I watched friends connect, getting together outside of dancing to engage in other social activities. My social life was dancing. I showed up alone and went home alone. I sat in front of the TV on nights I wasn’t dancing, or played games on the computer. Occasionally, I read something from my extensive and ever-growing library, but mostly, I was a lump. I got no exercise outside of my regular dance nights. I ate whatever sounded good, or what was easy to grab. I was angry at the world except when I was dancing. In a way, that life is a good thing as it reminds of how much I never want to go back there. And I look at my sister. We haven’t spoken in several years now, and the occasional overture she makes to reopen a conversation meets with firm rebuttal. It’s not that I don’t love her. But I’ve learned I can’t allow someone who finds joy in misery back in my life. She’s living a life I wouldn’t wish on anyone, but frankly, she was embittered long before she became ill. I know she’s in contact with the rest of my estranged family, so I know she’s not alone, and find some comfort in knowing someone will be there when her needs become critical. Even my youngest daughter seems to have found a common ally, so I hope she offers a little of her time too. This sounds like a ramble, but there truly is a point. There are members of my blood family from whom I’ve had to disconnect for my own sake. The disconnections seem to follow the same timeline as the one which connected me to a large family who isn’t related by blood, but which cares about the members as if we were. It appears that when I started realizing it was OK to be me and stop worrying about whether or not people would like that person, I started shedding those who expected things from me I wasn’t really prepared to give, and gained those who expected nothing, and gave because they cared. It took me far too long to learn to be myself; damn the torpedoes, and full speed ahead. But since I’ve found the way, I have a lot to look back on to remind me I never need to hide my beautiful, imperfect, lumpy, unique self again. I am grateful for the friends who are family and show me their love in so many ways. I am grateful I finally learned vulnerability is a good thing. I am grateful for the love and compassion I see every day in friends, in strangers, and in me. I am grateful for all the healing I’ve done so far, and the healing yet to come. I am grateful for abundance; love, friendship, support, encouragement, opportunities, new horizons, dancing, health, peace, harmony, philanthropy, and prosperity. I finished the draft of my novel last week. Even so, I didn’t plan to refrain from writing for nearly a week, but that’s how it played out. Granted, I spent several days at my daughter’s house and she kept me so busy that by the time we got home each night, I was too exhausted to think, much less drag my laptop out of its case, shlep a TV tray upstairs and plug the thing in. But here I am, sunburnt, surrounded by my cats and getting back into my normal routine; except that instead of writing, I’ll be editing and revising for the next few months. I might even keep the promise I made to myself to finish some of the projects that are already on my plate! But first, I really must kvell. My amazing, talented, incredible daughter gave me the most phenomenal weekend ever. She cooked a delicious dinner on Friday night complete with chocolate lava cake. On Saturday, we went to a chocolate festival, a pow wow, the zoo and Old Town (yes, all in one day which began rather early for me!). Sunday started with brunch with Shamu followed by a day of wandering around Sea World (I swear, she kept running me around in circles just for fun! ), riding rides, getting soaked by evil, hose wielding villains, watching shows, visiting with the animals, booping the rays, (did you know they’re really soft?) tasting some delicious food festival treats and meeting the executive chef behind it all. We finished the day with pizza and salad from her favorite pizza place, Pieology while watching a movie which never really lived up to the hype. Once again, my normal schedule got all out of whack as I got moving earlier and went to bed earlier than normal (hence the void where my writing should have been). But all that is about to change! Once again, it is after midnight and I’ve set my fingers on the keyboard. Now that the cruise is behind us and the best Mother’s Day weekend ever is as well, I am making a couple of new commitments to myself. First, I will get back on my three days a week or more gym schedule. Second, I will begin revising Frederick the Gentlemouse before embarking on the much larger project currently known as Sasha’s Journey. Third, I will either pitch or write blog posts for other people. I haven’t yet set myself a weekly minimum, but as time passes and I get a feel for the time required, I will do so. Fourth, I will start pulling up the disgusting carpet in my bedroom which has been the last holdout for a very long time. If further decluttering occurs in the process, so be it. That should be enough to keep me busy for awhile. I’ve learned that if we put too much on our plates, we overwhelm ourselves and nothing gets done, or it gets done, but only half-assed. I aim for quality rather than quantity. When my mother was alive, I referred to holidays at her house as “command performances”. She would invite us, but it wasn’t one of those things where you could beg off because you had other plans. Declining the invitation was not an option unless you wanted to hear about your lack of gratitude for months to come. Needless to say, I came to dread those occasions and, in hindsight, ruined my share of them with my own crappy attitude. But some good did come of the experience. I endeavored to ensure that my own daughters never felt that they had to celebrate a holiday with me nor were they ever obligated to give a gift. With the exception of certain things like funerals, I’ve always believed that we should participate willingly or not at all. Then, you have my daughter, Heather. Heather developed a love of celebrations. She will celebrate just about anything and when she does, she puts her heart, soul and creative talent into making it as wonderful as possible. I believe I mentioned that she’s been planning my 60th for at least five years! There are many memorable birthdays and Mother’s Days as a result of her celebratory nature. My personal favorite is still the multi-course breakfast-in-bed she and her sister prepared with the crowning glory of a microwaved grilled cheese sandwich (they were too young to use the stove unsupervised). The common theme to all of our celebrations is silliness. There is always an enormous element of fun woven into the festivities. Whether its a weekend like the one just past or a party at our favorite dance club or anything in between, the parties are meant to please not only the person being feted, but everyone involved, and my talented daughter achieves this each and every time. I have maybe two weeks before the celebrations begin again, this time for about a month as we have several things to celebrate. Guess I’d better get going on those intentions so they’re solidly in place before the insanity begins! 1. I am grateful for a truly delightful weekend with my daughter and grand furries. 2. I am grateful that the sunburn I acquired from two days in the sun without sunblock (my own fault) is not painful. I’m also grateful that both my daughter and I keep aloe body butter in the house. 3. I am grateful to be embarking on a new part of my journey. 4. I am grateful for surprises. New things come to me fairly regularly now, and the challenge is in picking which ones I want to do first. 5. I am grateful for abundance; love, friendship, exercise, sunshine, rain, creativity, motivation, inspiration, joy, health, harmony, peace, prosperity and philanthropy. For nearly three decades, my daughters and I have been creating our own family traditions. Some of those traditions, like teaching little girls to make Snickerdoodles or read favorite books came from previous generations, but most of the ones we enjoy every year started within our own nuclear family. Thanksgiving time is the start of the bulk of our family traditions, beginning with an enormous turkey and a vat of mashed potatoes to ensure leftovers for everyone. Over the years, homemade cranberry sauce and a completely scratch cooked meal have topped our list of favorites, and my daughter and I look forward to the creating every year. But still, the meal evolves. This year, for instance, we added shredded carrots to the stuffing and Heather used fresh pumpkin for the pumpkin cheesecake. She also did a lot more of the chopping and we finished the stuffing in record time thanks to skills she’s acquired in her Culinary Arts classes. We also made a wonderful butternut squash side dish so as not to waste some of the bounty in my Harvest Box. It may just be a do over for next year, it was so good (garlic olive oil notwithstanding). When all was said and done, I had this much stock to work with. I used the whole green bowl and part of the yellow bowl to make my huge pot of soup. Eventually, it all consolidated down into a big bowl for me to eat this week. 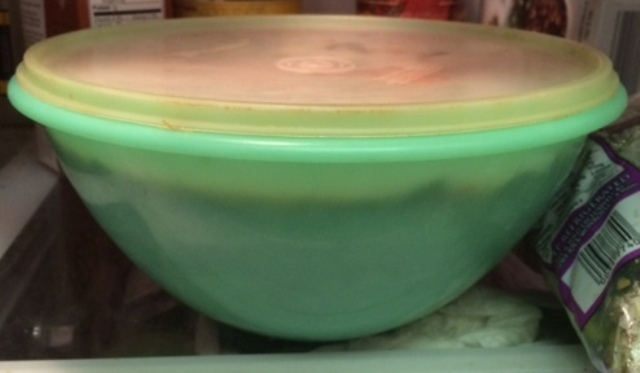 And a freezer full of stock and soup to either share or save until I’ve used up what I left in the refrigerator. Combined with all of the other cooking I’ve been doing, my freezer now looks like I’m ready for either a siege or a blizzard, neither of which is likely to occur. 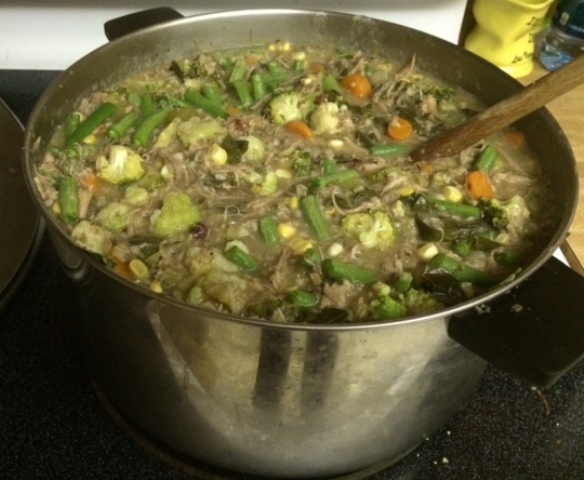 I sure won’t have any reason to complain that I’m lacking soup this winter, and as we have a week of rain scheduled (yes, Virginia, it does rain in Southern California) I have plenty of warm, hearty vittles to fill my belly! I know, I know. The topic of this post was Traditions, and I really will get back there, I promise. But I’ve also gotten in the habit of sharing my mega cooking antics, so the annual turkey soup endeavor had to be included. Tradition: whether passed down for generations or created anew, they are made with love and are the glue which binds us together. Truth be told, this soup making has become almost as big a part of our family Thanksgiving as preparing and sharing the meal itself. Sometimes I think my daughter looks forward to the soup even more than the turkey (though I know better as that child really loves her turkey!). Even now that she lives a bit of a distance away, I’ve set aside a large container of soup and another of stock for her to retrieve when next she visits. I might as well earmark some for her as I know she won’t leave here empty handed anyway! I’d love to hear about some of your Thanksgiving traditions. Did they come from your family or have you created them yourself? I’m limiting this one to Thanksgiving as I know we’ll have tons to talk about when we start talking Christmas and Chanukah. 1. I am grateful for Traditions, both old and new. 2. I am grateful for a well-stocked freezer to get me through the chilly winter months. 3. I am grateful for family, both blood and adopted. Without them, nothing really matters. 4. I am grateful that the Great Turkey Soup Caper of 2014 has wound to a close with everything safely stowed away until needed. 5. I am grateful for abundance: Turkey Soup, friendship, traditions, love, camaraderie, blessings, hope, faith, joy, commitment, happiness, harmony, peace, health and prosperity.